NEW YORK, NEW YORK – January 18, 2019 – GameChange Solar today announced that in a timed video, three men were able to install First Solar Series 6™ modules at a rate of 31 seconds per module, working at a steady sustained pace. This install rate of 930 modules per day for three workers, or 310 modules per worker per day, is a revolutionary breakthrough in installation speed for single axis trackers, which substantially reduces install cost for the solar industry. Derick Botha, Senior Vice President of Business Development at GameChange Solar, stated: “Our customers have been asking for innovations to improve installation speed specifically for First Solar Series 6™ modules. 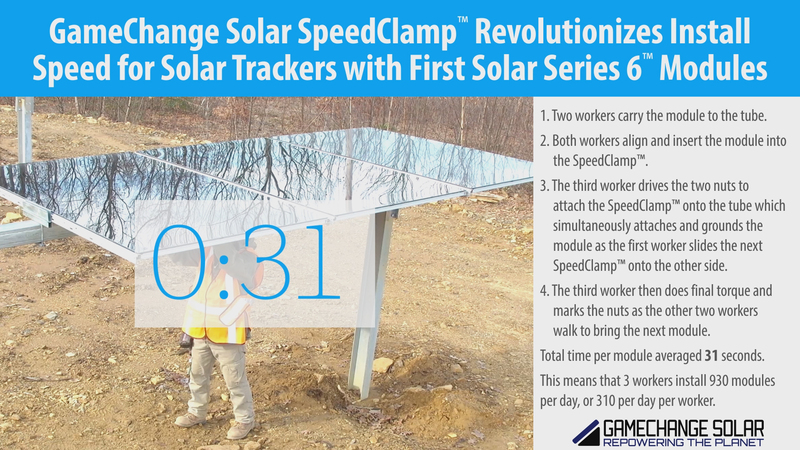 Utilizing the SpeedClamp™ for module installation, the single axis GameChange Solar Genius Trackers™ is now faster to install than any other trackers for First Solar Series 6™ modules."